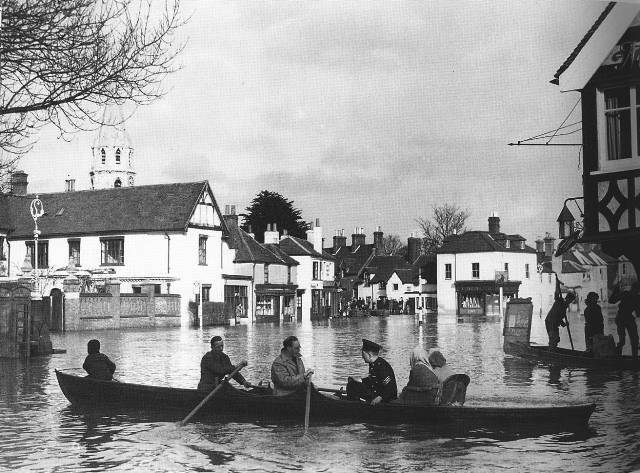 Datchet’s historical records from the 1600s onwards contain many accounts of flooding, including ‘great floods’ in the years 1774, 1809, 1822, 1852, 1894 and 1947 (see photo left). All of these seem to have been more severe than that of 2014, although it is difficult to compare the rural village with the modern built-up area. Lesser floods were a common fact of life and until the late 1800s dwellings were not built where flooding was likely. Early settlement along this stretch of the Thames only took place on ‘islands’ of high ground, as elsewhere along the Thames floodplain. Datchet’s two islands were at Southlea, where there was a prehistoric village, and the site of the parish church which was built upon from Saxon times and around which the medieval settlement developed. It still provides a safe base for flood rescue teams. Apart from the river banks, Datchet’s chief protection was the ancient Sumptermead Bank, still relevant to the village today. 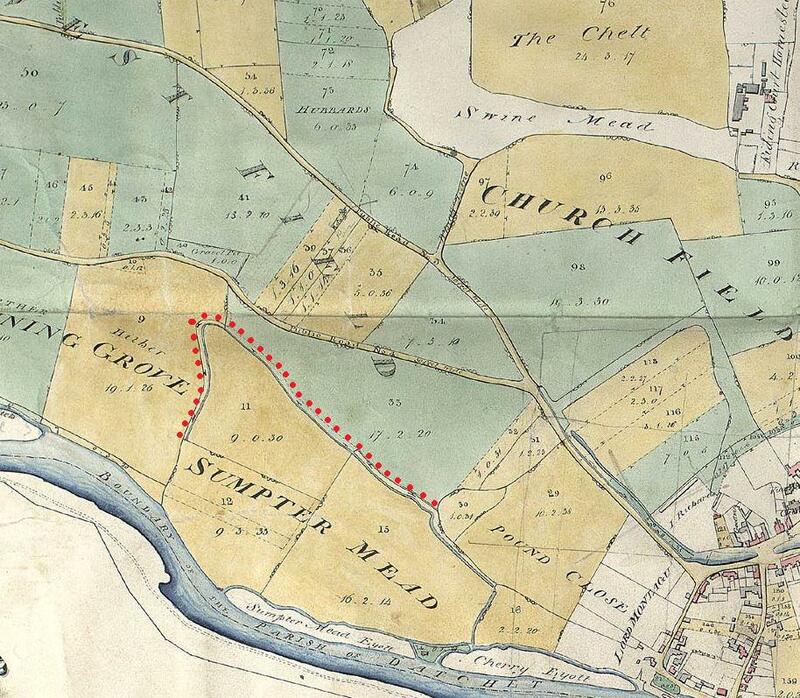 Its role seems to have been to allow the swollen river to flood Sumptermead (which was a valuable water meadow), but to prevent it flowing further north and east. It is shown in the earliest large-scale map of the parish, dated 1834 but surveyed 1810-13. The bank has been highlighted in this detail, the inner line being the ditch below the bank which feeds back into the Thames. The age of the floodbank (or bund) is unknown, but Sumptermead as a field name was recorded in 1263, in a dispute about its ownership. Flood banking, ditching, defence and drainage, have always been understood from experience by farming communities. Also see photos of the bank in 2014 at the end of this account. For complete 1833 Enclosure map see here. From the Middle Ages to the early 1800s farming was managed communally through the authority of Datchet Manor Courts , which were held in the Manor House by the Lord of the Manor. The main court rolls, or minutes, which were concerned with ownership of property, survive from the mid-1500s but the agricultural orders only from the 1640s. These orders also reported on the condition of bridges, fences, ditches, watercourses, gates, and flood banks. Those who failed to carry out repairs on their land were fined, and orders for the next season were issued. It was not the court’s business to describe recent events, so there are no records of bad flood years, only orders to carry out repairs to the village’s flood defences after they had been damaged. During 1645 landowners were ‘fined for not amending Sumptermead Bank’, and instructed to ‘make up the causeway leading to Sandley House‘ (next to modern Woolacombe in Southlea Road). 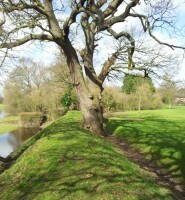 In 1647 owners were required to repair Southley Bank, which was likely to be a bund type defence because the river banks are referred to every year as ‘making up Thames banks’. 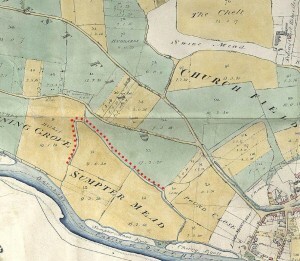 Later that year owners were ordered to mend breaches in Sumptermead, Running Grove and Southley Banks (for Running Grove see map above). Nine named owners in 1702 were to ‘make up their own parts of Sumptermead Bank, and in 1714 one owner was to make up both sides of Sumptermead Bank which are out of repair. The Bridge House Trustees had been responsible for the bridge over the stream in the middle of the village since Elizabethan times, when the Royal Stag was designated as the ‘bridge house’ and its rental was to pay for upkeep of that bridge. However, in 1724 money was found in the Datchett Bagg which could not be accounted for so the Trustees needed the Court of Chancery’s ruling on how that was to be used and on the future application of their growing income. In regard that the town and parish of Datchet lies in a low and wat’ry country and the waters in times of great rains and floods overflow and run in many low places making sloughs therein and thereby incommode the inhabitants of Datchet not only in their way to and from their Parish Church but likewise in their passages to their common fields, common grounds and public roads, and that therefore the surplus of money together with the arrears and growing rents and profits of the premises should be laid out by the new Trustees towards erecting and keeping in repair other bridges or causeways in such places as they should be wanting and necessary for making and providing passages over such watery ways for the convenience of the Parishioners and others. 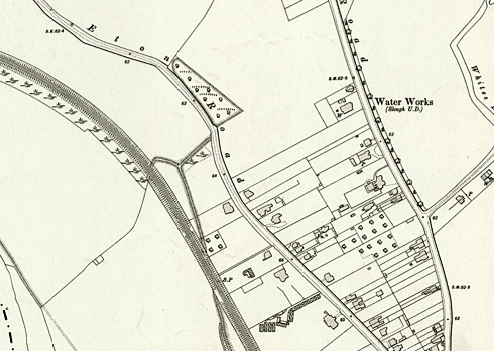 So the Trustees embarked on years of minor bridge-building and repairing, particularly along Horton Road which crossed streams all the way to the parish boundary; the brick arched bridge over the stream near Tesco originated as one of theirs. Other activities were not in their remit; at this time they could only spend their income on the approved purposes. Following the great flood of 1774 they took legal opinion on whether the Trustees were empowered to raise the banks of the Thames in order to prevent the water overflowing the town and the common fields. Since they did not then do so, the answer must have been that they should not. After the winter of 1809, the Trust paid for many days’ labour, materials, and a horse and cart, on the Causeway, which ran between Southlea Road and the river bank, leading to the riverside property which we know as Woolacombe. There were three separate periods of work here, sixteen ‘long’ days in all, including drawing clay to repair from the Thames side. Land in the whole southern and eastern parts of the parish were vulnerable from this point, as in 2014, although the chief fear now is for houses rather than agricultural land. The high bank above the river, seen here in the 1890s, may have its origin in the one built by the Bridge Trust in 1830. 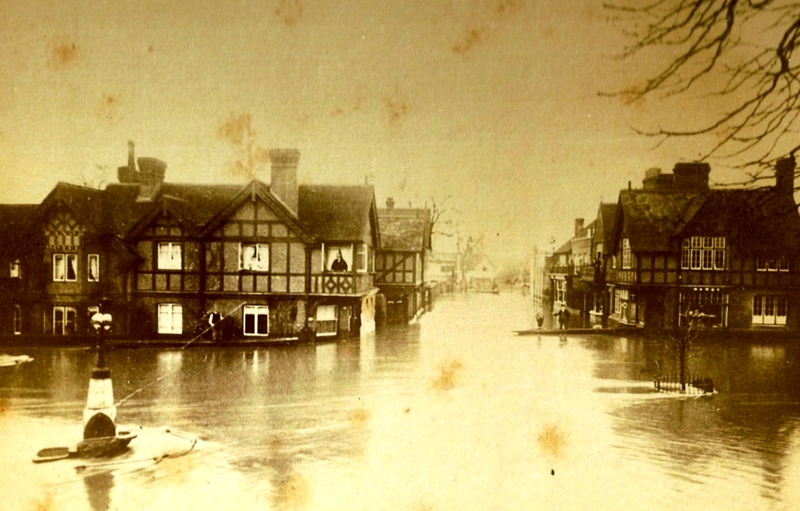 The next major flood, which was reported to have washed down the corner of the Manor Hotel, was in 1822. It was followed by a decade of intermittent work on Sumptermead Bank which protected the north western areas and the village centre. The Trust paid for labour and materials for repairing the bank, and also for watchmen during the threat of flood, as well as straw (presumably to sit on), their lanterns and their beer. Then in 1843 it was reported that Jennings of Upton Farm having Cut the Bank and thereby endangered the lands and village in case of flood, the Trustees obtained a cartload of clay and repaired the same. There is no information about whether Jennings was required to pay for this. The causes, the effects, and the events following this flood are particularly relevant to more recent events. From the late 1840s to 1852 the South Western Railway Company was negotiating the route and then building their line from Staines to Windsor Riverside. They were buying land and property as fast as they could because they were racing with the Great Western Company for the prize of a line to Windsor; the GWR’s branch line from Slough built the Windsor Central station. 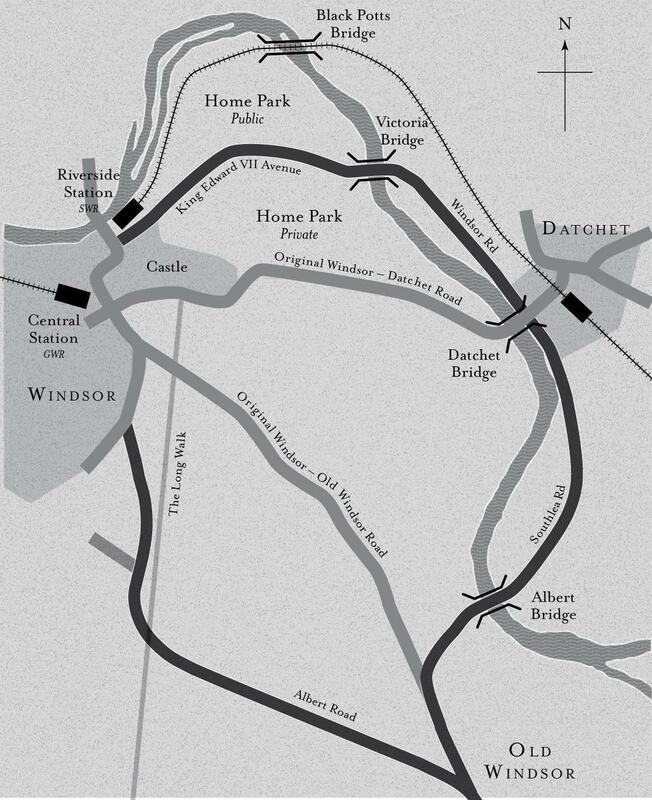 At first the Crown and the Town refused access beyond Datchet but then saw the possibilities of re-routing roads and bridges around the Castle as part of the Windsor Improvement Plan. The last stages of the work, approaching Black Potts, were carried out in a panic as the GWR was moving fast; both their lines over the Thames collapsed during building. The GWR won by a few weeks. 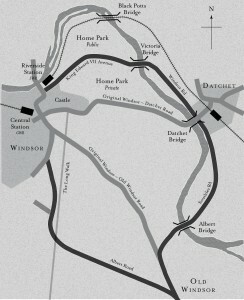 Crown allowed rail line across new Black Potts Bridge and established new Home Park public area, then Castle grounds closed. Removal of Datchet’s Thames Bridge and old direct route to Castle replaced by the Albert and Victoria bridges built by the railway company. 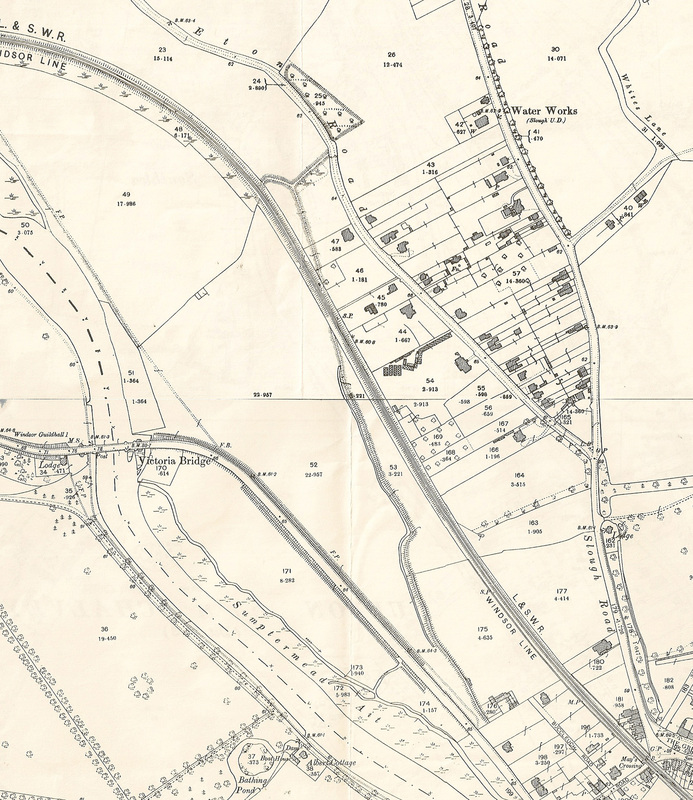 All the houses shown here had been built since the previous OS map survey of 1876-82. A marshy area is indicated south of the section of bank towards Eton Road, which seems to have been built since the 1810 survey. The railway embankment and the flood bank merge into each other where the railway slices through. As the flood has risen to the alarming height it has done and as the emergency is very great and the danger of inundation to the village very imminent, I will thank you forthwith to do what is necessary to avert the overflow of the water on the roads and land of the village. They find that owing to the want of culverts or viaducts under the new road (Windsor Road) on each side of the Victoria Bridge the flood waters are unable to take the courses they have usually done over the Home Park, but are thrown back over the estate of Black Potts and from thence across the low lands of Datchet on both sides of the railway and overflowing the Sumpter Mead Bank have inundated the village of Datchet causing much injury, inconvenience and in many instances much distress to the inhabitants. They also find that from the construction of the Albert Bridge the flood waters are diverted from their usual course on the Berks side of the river and thrown much more on the Bucks side, and they are of opinion that two more arches should be added to the bridge on the Berks shore and that a river bale or bank should be made on the Bucks side to direct the current of water to its natural course in the bed of the river. They also think it highly desirable to raise and widen the present bank from the railway near Black Potts across Dutchman’s land and along Messrs Jennings field (Upton Court Farm) as far as the corner of Mr Agar’s meadow, and at this latter point to erect a sluice or flood gate, this will prevent a very large body of water flowing by Mr Beauchamps’ cottages (Myrke end of Slough Road) over Messrs Jennings’ land and along White’s Lane into the village. The expenses of the last mentioned works might be defrayed by the Bridge Trust if their funds can be made available for such purpose, but if they cannot be made so available, the money must be raised by rate or subscription aided by the contributions of the landowners and landholders whose property would be greatly benefited thereby. The committee are also of opinion that the viaduct under the railway near the windmill on Datchet Common (at Mill Place) is both unnecessary and injurious, it admits a very large body of water from the southern to the northern side of the railway, which ought to find its way by the river at the corner known as Colnbrook Churchyard (on old Horton boundary). They also find that this last mentioned body of water having passed the railway became united with the water flowing down the village and has no means of regaining the river except through the small culverts, one on each side of the bridge over the railway at Welley, and they feel confident that it would be beneficial to the parishes of Datchet and Horton and also to the Railway Company if these two culverts were very much enlarged or wooden viaducts laid down instead. The committee therefore recommend that memorials (memoranda) should be presented to the Commissioners of Woods & Forests etc and to the South Western Railway Company calling their attention to the injuries done by their respective works, and to request them to adopt such measures as will prevent recurrences of such disasters. There is no information about any correspondence the Bridge Trust actually had with these organisations. The Trust then embarked on a huge programme of rebuilding Sumptermead Bank, after agreement from the landowners and tenants. Unusually, a contractor was employed (Meads & Taylor), and W J Buckland the district’s surveyor was paid for taking levels and fixing stakes in the Bank. In total 1,090 cartloads of clay were paid for and the whole cost was £150, well over £10,000 in modern values. Although the Trustees organised, and at least partly funded these works, they believed the Trust did not have responsibility for Sumptermead Bank. In fact this was the only local organisation which could have carried out such a programme before the advent of county, district and parish councils from the 1880s. The Trustees did, however, continue to contribute towards repairs into the twentieth century. 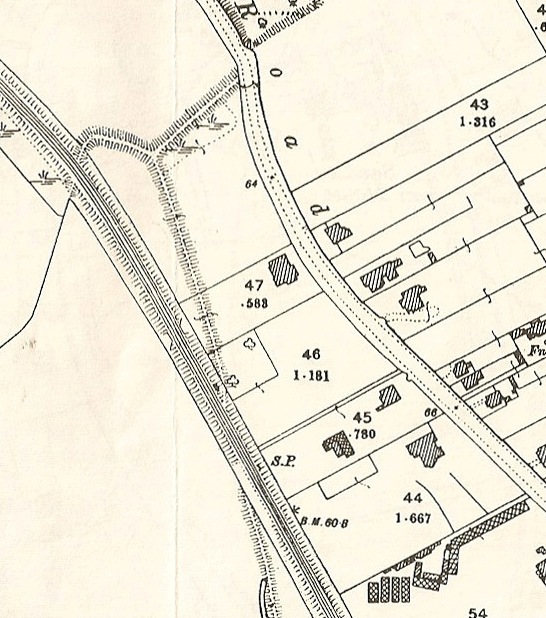 By 1899 the arm of the Bank running south-west along the boundary between Sumptermead and Running Groves had been removed and only the diagonal line of the field boundary remained. This can still be traced across the golf course as grassy bumps. Eton End School’s plot is numbered 47. 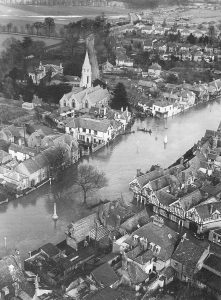 Great inconvenience has been occasioned in Datchet by the flood, which has far exceeded anything known since that of 1852, which itself, say some of the oldest inhabitants, was less than those of 1828 and 1822. 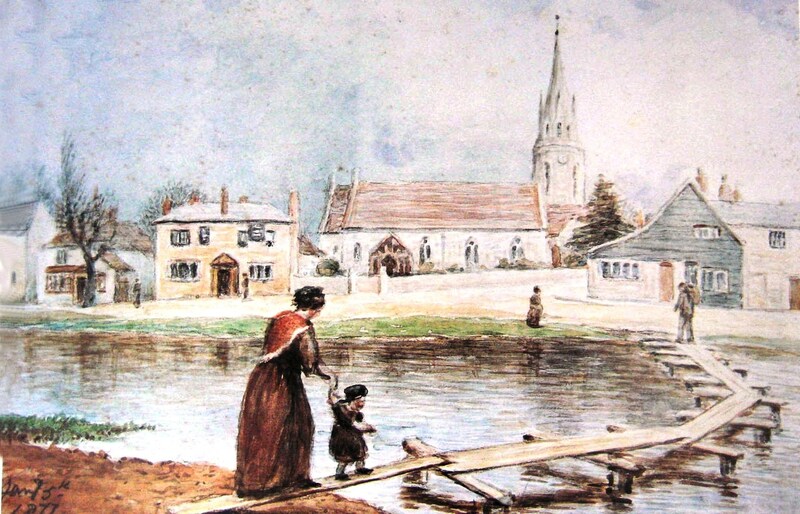 The appearance of the village was very strange – a stream of considerable depth running rapidly through its midst, and punts plying between the road in front of the Rectory (Old Priory) and the Manor Hotel, the Back Lane (Queens Road) and the Slough Road. At the Welly (cottages on corner of Welly Road to Wraysbury) the water is in all the lower rooms and the Common has been quite surrounded. 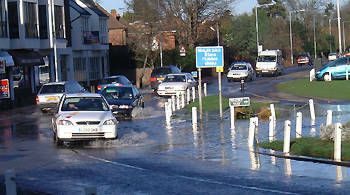 The roads to the village and Ditton were both quite impassable and the deepest part of the inundation is in Slough Road. As we write the waters are rapidly subsiding. Since our last we have experienced a return of the floods, and this time to a very serious extent, though the water does not seem to have been quite so high as in 1852. 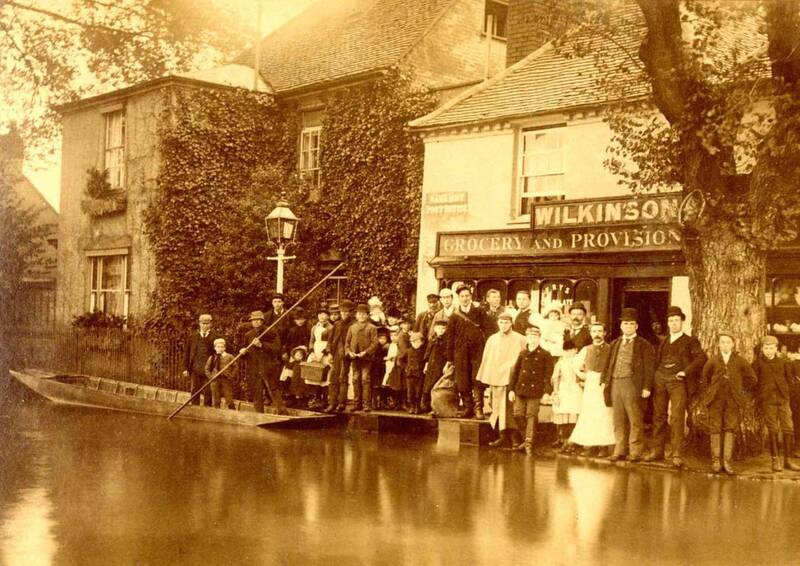 In the village itself the inundation extended almost from the railway crossing up to the steps of Mr Wilkinson’s shop (The Bridge), and the whole Common, roads and fields alike, was completely submerged. Through the bounty of various kind friends, a system of relief was immediately organised: punts and a cart were provided for those who were cut of from their work by the waters, and a supply of coals, grocery and bread sent to each family. A further quantity of coals has since been given to dry the houses, and chloride of lime sent round for use where needed. Some fear is expressed of a second return, but Father Thames has shrunk into his natural bed and there are no symptoms at present of any fresh uprising. 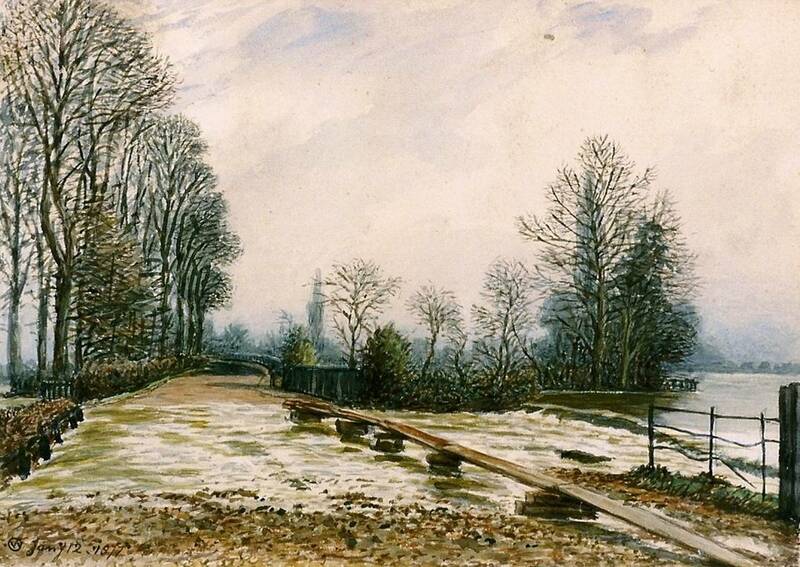 Flood Southlea Road 1877, watercolour William Corden. There was a flood in 1891 and then a Great Flood in 1894, the last major one before 1947. The headmaster of the village school wrote in his log book: Nov 16th, School closed on account of the floods. The water rose 3ft in 4 hours. In the evening it had entered the school house and school rooms. Greatest height 18 inches. During the whole of the second week in November the river was rising rapidly after the heavy rains which had fallen. Ere long the flood which many had expected was upon us. 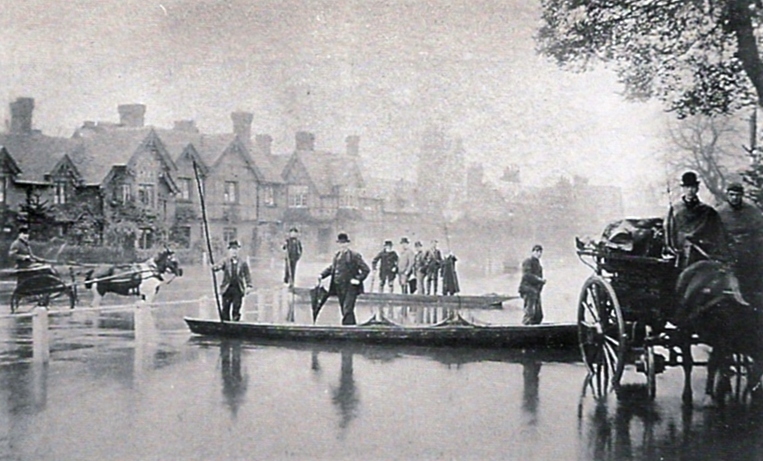 Early in the morning of Friday November 16th the village green was invaded by the water and punts had to be resorted to. It was soon apparent that the flood of 1894 was going to be no ordinary one. 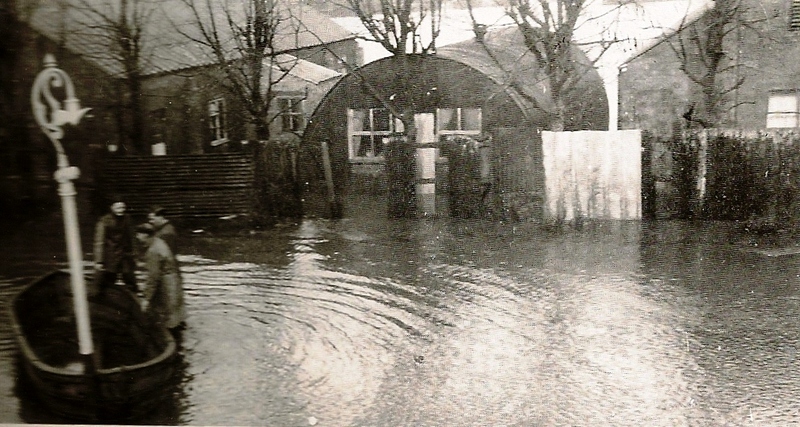 The water continued rapidly rising, reaching many houses which had escaped in previous years, and submerging parts of the parish which were generally considered above the flood level. Next day the village green was a seething mass of water of considerable depth and the force of the current was so great that on more than one occasion punts were upset and the occupants thrown into the water. Not till late on Saturday night did the waters reach their height. On Sunday it was strange to hear the church bells ringing while many were prisoners in their upper rooms. On Sunday night the fall in the level of the water began to make itself felt, and by Tuesday afternoon many of the imprisoned inhabitants of the Avenue and Montagu Road were able to leave their houses on foot. The punts continued to ply on the green until Thursday, when people were able to make their way round the water on dry land. It will be a long time, however, before all traces of the flood have disappeared and the damage which has been done to property can be repaired. As trains were suspended from Saturday till Tuesday of the following week, the village was completely isolated and there was difficulty in obtaining food and firing. This was largely overcome by those who, at considerable risk to themselves, conveyed coals and provisions to the flooded houses. 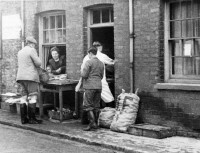 Mr Hawes the baker was able to make his way through the streets the whole time of the flood and to deliver his customers from the danger of starvation. In fact, during the whole time of distress there were many of those ‘friends in need’ who are ‘friends indeed’. Weeks later, the Bridge Trust had Sumptermead Bank inspected and, finding it much damaged by the recent flood, spent £20 on repairs. The Trustees agreed to consider ways of providing better protection from floods and intended to co-operate with the Railway Company. There is no further mention of this in the Trust’s minutes. 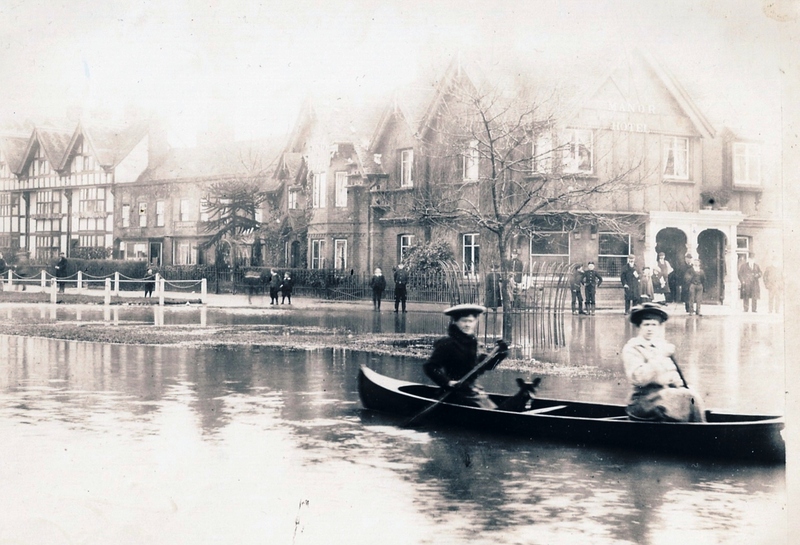 Datchet Parish Council was newly formed and met for the first time in January 1895, when they discussed possible causes of the recent disastrous floods and discussed solutions for the future. 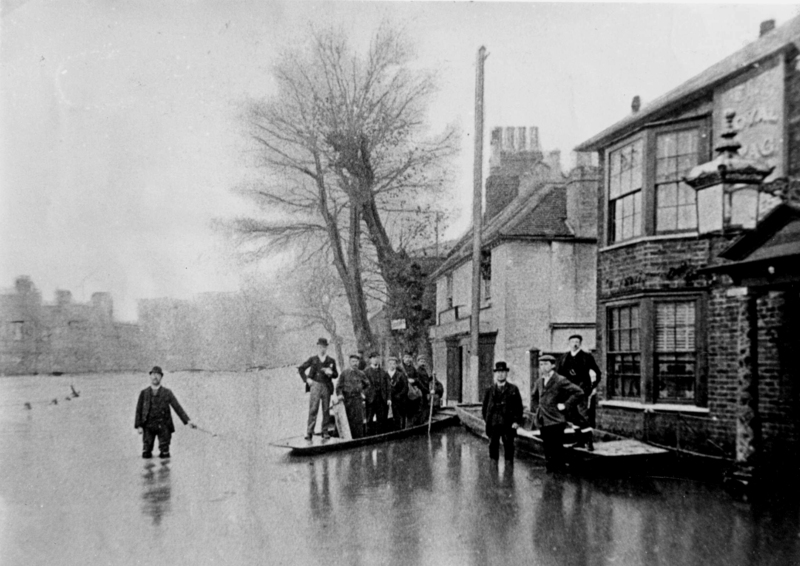 Their first instinct was to blame the Thames Conservancy for not keeping the river at a lower level before the flood water came down, by the management of weirs and locks. The TC’s answer to this was that they had to consider the mill-owners and barge-owners on the river, although there were by now far fewer of these than in the past. One Councillor’s view was that the Thames Conservancy were rather a peculiar body and did not seem to take much notice of anybody else’s views of matters affecting the Thames. He also spoke about Sumptermead Bank, where steps had been cut out of the bank for the benefit of golf-players. He thought they ought to have some proper steps put there, with a handrail, because it would be so much better for the ladies, and considered it was wrong to have cut away the bank. At the next meeting it was Mr de Paravicini’s suggestion that the South Western Railway Company should be asked to enlarge the culvert on the Datchet side of their Black Potts Bridge to allow flood water to escape, and for the arches on the Windsor side of the bridge to be re-opened. By May, Eton Urban District Council had put forward a scheme to protect Eton in the future, bringing more water down to Black Potts much faster by increasing the fifteen-arch bridge on Slough Road, to which the Councillors were opposed as it would be detrimental to Datchet. Mr Hunt, a builder whose family had been in Datchet for generations, thought that the Victoria Bridge should have been built with more arches, and also said the cause of the flood was the new Windsor Road (which he remembered bring built in 1850) as it formed an embankment that shut in the water. These and other ideas were much discussed but no outcomes are known, except that the Bridge Trust’s offer of funds to repair Sumptermead Bank was gratefully accepted by the new Parish Council. 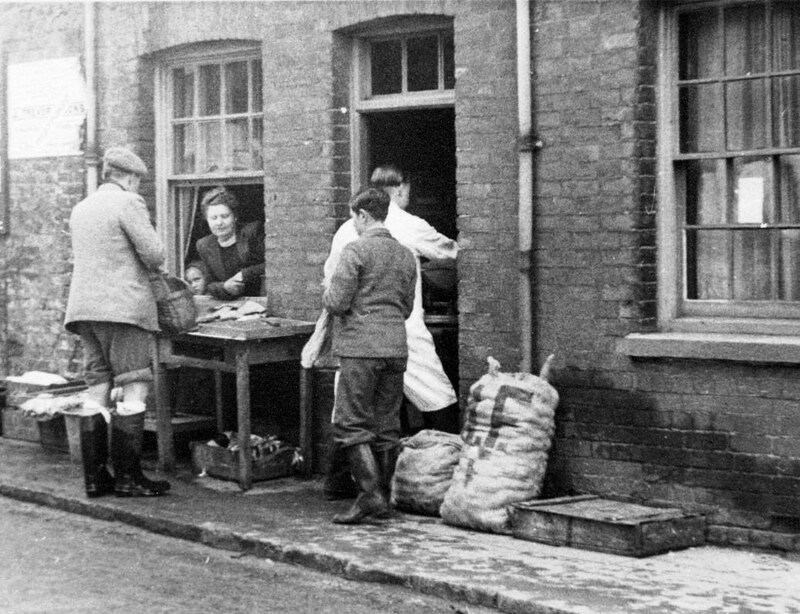 The winter of 1947 was a terrible one, especially when people’s recovery from wartime had scarcely begun. The playground at the village school is remembered as being solid with ice (and ice slides) from before Christmas until Easter, and by the middle of March the country’s rivers were seriously swollen with melting snow and ice. Conditions like this had produced the greatest floods in the past, and some sources suggest that of 1947 was the worst of all – certainly more serious than the recent one of 2014. “The greatest flood of the century and the worst catastrophe in living memory engulfed the Thames valley over the weekend”. 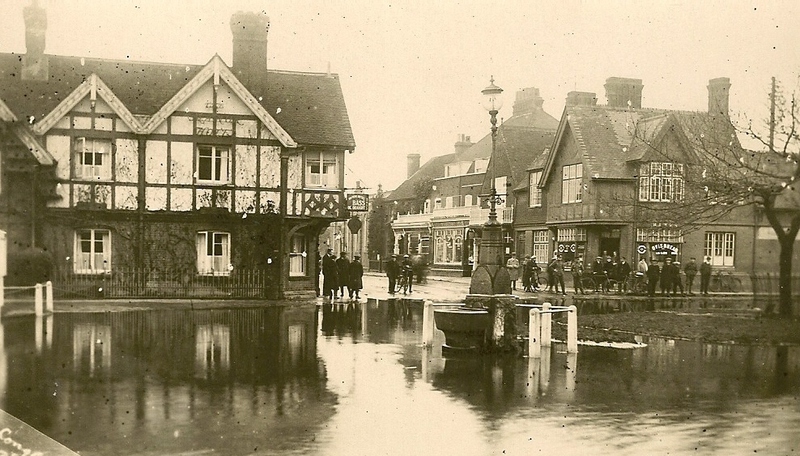 On the afternoon of Sunday March 16th the water came pouring into the Green and over considerable parts of Datchet, inundating houses and shops. Datchet Parish Council, Datchet firemen, Eton Rural District Council, the Emergency Food Council, the School Meals Service, the police, the army, Red Cross Society and the Women’s Voluntary Service, as well as local tradespeople and a number of Datchet people have done wonders in organising and carrying out ways of delivering food, including hot meals, by means of army ‘ducks’ and lorries, boats and punts. My offer for the church to be used as an emergency centre was not eventually needed, but has been used to store an ecclesiastical chair and a lectern which came floating down the water on the Green, (perhaps from St Augustine’s Church in Eton Road?) and for supplying infant welfare foods. Datchet people are deeply grateful to all those who worked so hard and so well for them. The events began on Saturday 15th March and Wraysbury was first to be affected, followed by Welley Road some water seen in Datchet. The people living in huts at the Polo Ground camp in Horton Road were evacuated and taken to the village school which was thought at that time to be safe. On Sunday Sumptermead Bank (which was being watched) gave way and urgent phone messages were sent to the Parish Council, who were holding an emergency meeting in the Royal Stag. 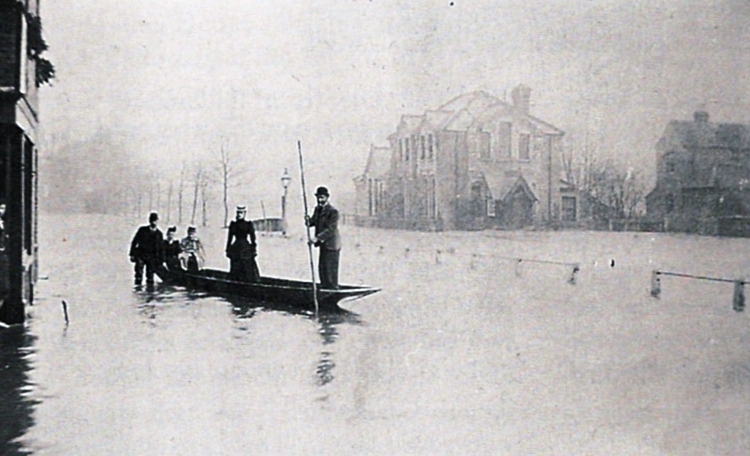 The railway line flooded and water rushed through the Greens, rising at the ‘incredible rate’ of three inches an hour. It entered the school so that it had to be abandoned and the people already there evacuated to emergency centres around Slough. Emergency relief work began and the authorities met in Slough Town Hall, led by the Mayor of Slough. During Monday the water was still rising, but at a slower rate, and by Thursday it had begun to subside. Datchet Parish Council delayed their next scheduled meeting because the minutes were in their flooded office, (still called Old Council Offices next to Grosvenor Stores on the Green). After this flood, anxiety focused on the proposed reservoirs at Wraysbury and Datchet, and the perception that floods may be worse or more frequent in the future; it was decided to work with Wraysbury in approaching the authorities. 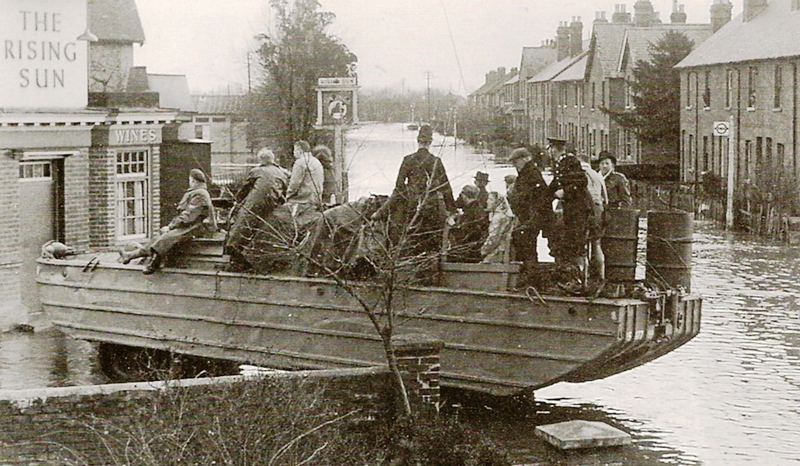 They then discussed the question of punts missing after being requisitioned, and the fire service’s experiment of pumping flood water from the centre of the village into the river, which had been a great success. Flooding had caused problems at the Ditton Road cemetery, especially for three families whose relatives had been buried during the flood, and the Council voted extra money to sort out the situation. Letters had been received from the Ministry of Town and Country Planning, concerned with control of building land liable to flooding; probably the first instance of this now very familiar topic. The Sumptermead floodbank was inspected and negotiations were carried on with the Golf Club for the removal of plank bridges and reconstruction of concrete steps to make them higher. The Clerk approached Crown Estate (the Golf Club’s landowners) about the cost of floodbank repairs, but there was nothing in the lease or correspondence that suggested they had any liability. The Council’s solicitor reported that the Thames Conservancy also accepted no responsibility for the upkeep of the floodbank. Eventually, tenders were put out for repair of the breaches in subsidiary floodbank (a term not used before and its meaning unknown) which might have to be repaired by volunteer labour, although the skills of qualified engineers would be preferable. In the end it was decided to pay for repairs regardless of cost and as a matter of urgency. They also committed to a full scale and expensive restoration of the village greens, which a year later were still suffering from flood damage. Work on the river had been reduced to a minimum during the war period, apart from the most urgent of repairs and dredging, which resulted in a considerable accumulation of maintenance works estimated to cost £330,102. It was only possible to undertake a small number of the most important of these works during 1945 and 1946 owing to the shortage of labour and materials. A high flood occurred in March, 1947, due to melting snow followed by heavy rain. This flood was second only in volume to the great flood of 1894. The daily average natural flow at Teddington reached a peak discharge of 13,572 million gallons on the 20th March compared with the standard average for that month of 2,083 million gallons. A contributing factor to the lesser flood of 2003 and the major one of 2014 was the previous removal of a section of the floodbank close to the railway line. 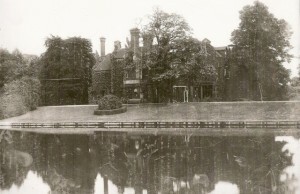 Until the 1880s there were no houses in Eton Road but by 1947 Eton End School occupied a plot on the other side of the line from the golf course, including a section of the floodbank. 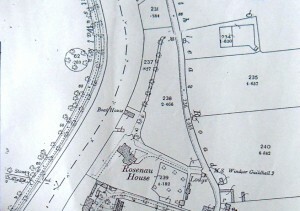 In the 1912 map detail left, Eton End was the single house with the bund running through the corner of its grounds close to the railway line. The access tunnel under the line is shown by two white semicircles. Flood water could flow underneath into a holding area where it was held in check by the bund except in the worst conditions, as in 1947. All the planning applications for various extensions to the school building since 2000, with reports, decisions and appeals, are in the public domain and online at RBWM’s Planning Portal, though not from earlier than that. In the 2000 documents there is a reference to permission granted in 1976 ‘to remove flood bank’, but nothing more is currently available online. 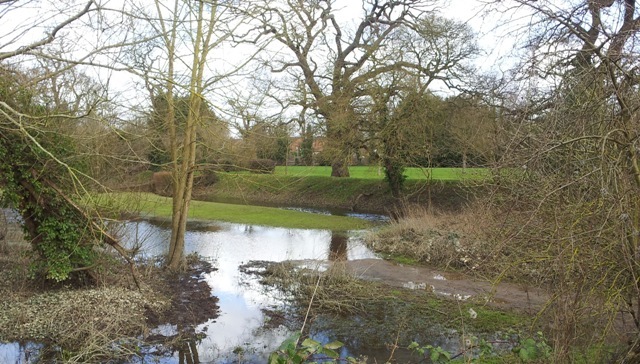 At the time the application was refused the Council’s approach was to continue to resist developments in certain areas pending completion of the Maidenhead, Windsor and Eton Flood Alleviation Scheme, then expected to be in early 2002. Rapid progress on that scheme resulted in it becoming operational in September 2001. The Environment Agency (EA) formally withdrew its objection to the appeal proposal in October 2001. The EA considers the site is now in an area where the annual probability of flooding is less than 1%; a medium to low risk zone, where most forms of development are suitable. 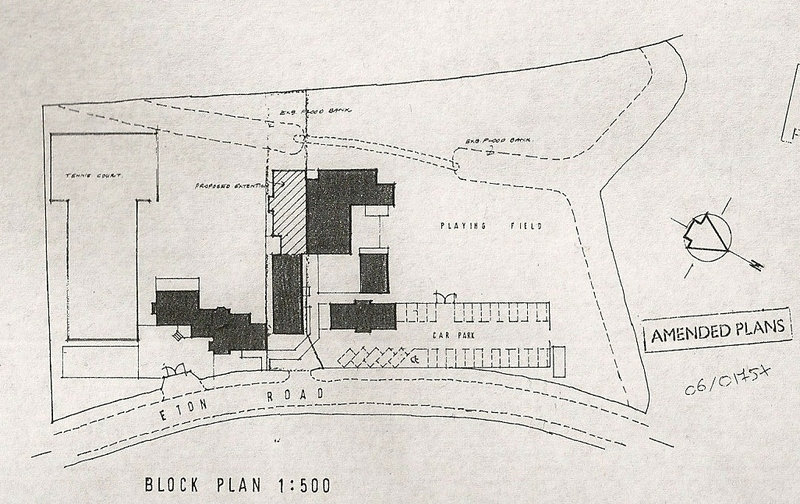 Plans for this extension do not show the floodbank, but from later plans it seems that a previous extension had encroached on the original extent of the bank and a section had been removed, leaving a substantial gap. 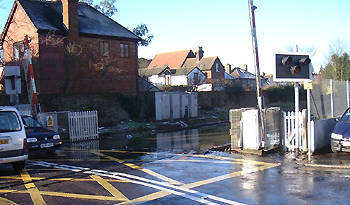 Persistent rain at the end of 2002 produced flood conditions on the Thames in early January 2003 and the EA’s new Jubilee River was put into operation for the first time. This is a highly contentious subject, but in Datchet the flood (wherever it came from) seems to have entered the village down the railway line from the breach in Eton End’s floodbank, since nothing was in its way. 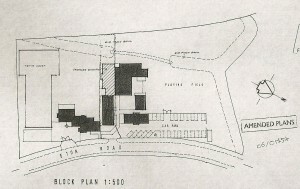 In February 2003 the school, having suffered badly from the flood, applied for planning permission for proposed reconstruction and re-alignment of the existing flood bank. Datchet Parish Council made objections to piecemeal flood defence work and recommended that the ‘West Datchet Flood Protection’ (ie Sumptermead Bank) should be installed properly and with urgency by the appropriate authority. The EA objected for different reasons: the proposed development involves increasing the area protected by the bund which will consequently reduce flood plain storage. They recognised the need to re-instate the bund, and in May 2003 suggested that the reinstated flood bund might be adopted by the Agency in future, dependent on the outcomes of the Lower Thames Project. Previously an earth bund has been constructed around the PNEU School which protected it in times of flood. Part of this bank had been removed in the past and it was due to this that considerable damage has affected parts of the school due to recent flooding. 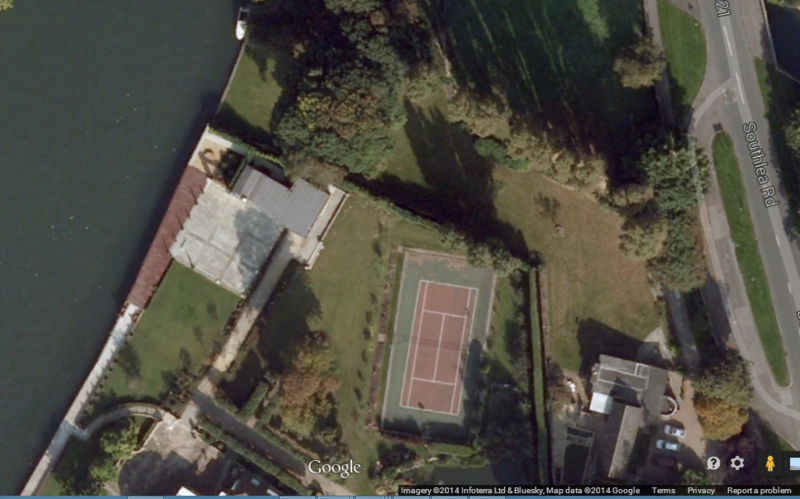 The proposed scheme is to reinstate the bund to enable it to carry out its original purpose, ie to protect the school. So the school’s advisors did not recognise what this ‘earth bund’ really was: a continuation of the Sumptermead Bank on the other side of the rail track, rather than protection just for the school itself, and the statement was not commented on by the EA or the RB Planning Authority. 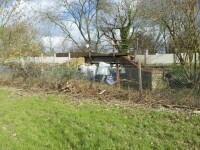 It may not have been seen by Datchet Parish Councillors who could have stated the flood bank’s actual purpose. However, further consultations with the EA about Land Drainage led to retrospective planning permission being granted in December 2003, but for a ‘sandbag wall’ (meaning a solidified concrete bag wall) across the gap rather than a permanent bund structure. The upper boundary line is the railway, with Sumptermead Bank re-emerging from beneath it into Eton End’s plot, as dotted lines, left. Its Y-shaped northern arm defines that side of the school’s site and reaches to Eton Road. This planning application included filling the central gap with a concrete bag structure that would be much narrower than the existing bank. This revised application was for an acceptably reduced footprint which needed no flood risk assessment. Datchet Parish Council’s conditions concerning the plan included, confirmation that the gap has, or will be, fully reinstated, ie floodbank. It is assumed that the plans were carried out, and since permission for the gap in the bund to be filled by a sandbag wall had been given, it seems that Datchet’s condition of a fully re-instated floodbank was not adhered to. This most recent flood was much more serious than that of 2003, although less serious than Great Floods of the past. Once again the breaching of Sumptermead Bank (or Eton End’s bund) was a major factor. 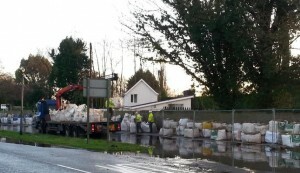 On February 9th, the same day as a severe flood warning was issued for Datchet, the Royal Borough advised Datchet Parish Council that the section of the bund that was made of concrete bags had been breached. By the next day flood waters were pouring down the railway line as in 2003, and by February 11th there was extensive flooding throughout the village. 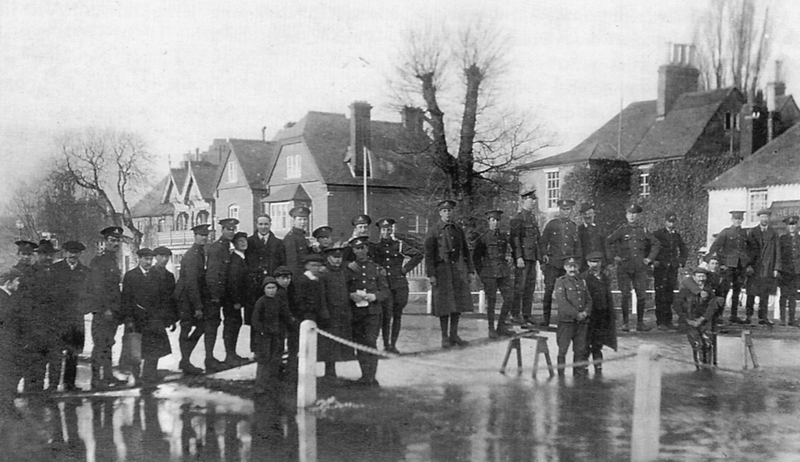 Early attempts to stop the flow from the school’s side had to be abandoned as the water was so high, but on February 13th the army successfully approached the problem of plugging the gap with sandbags from the height of the railway line itself. When they achieved this (with much-publicised help from Princes William and Harry), the flow stopped as if a tap had been turned off and the water in the village centre subsided rapidly as a result. A permanent repair to this breaching of the bank is being planned as a priority. 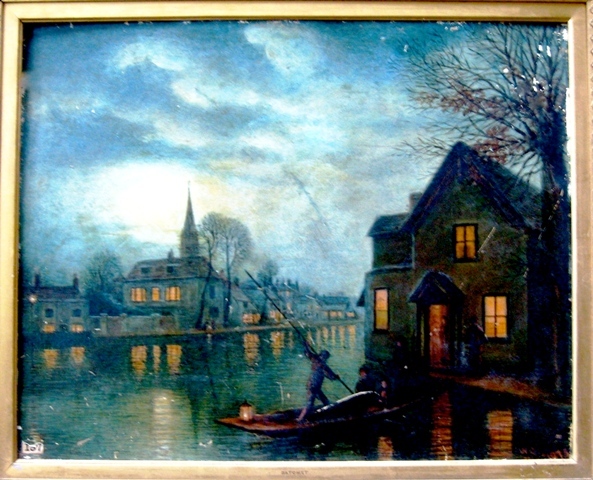 Earlier in this account it was shown that in the 1830s the Bridge House Trust built (or rebuilt) the bank protecting Mr Jarman’s riverside house and the land to its east and south. Rosenau House replaced Mr Jarman’s in about 1880, followed by Woolacombe which dates from the 1930s. This detail from the 1899 O.S. 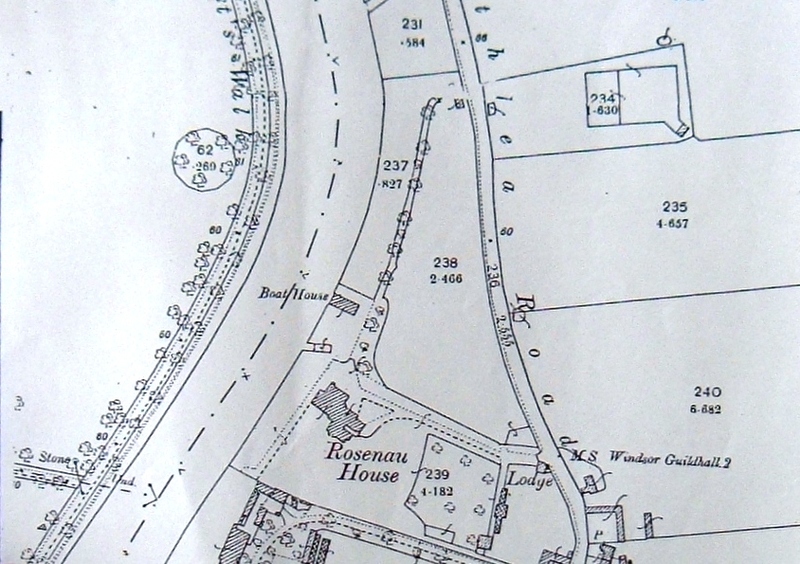 map shows Rosenau’s raised platform above its steep river bank, as in the earlier photo of the house. The bank continues north to a boat house, and then continuing further along from there the line of trees represents the old causeway from Datchet to Southlea’s riverside houses. In recent times another house, the Poplars, has been built near to the road in Woolacombe’s grounds. 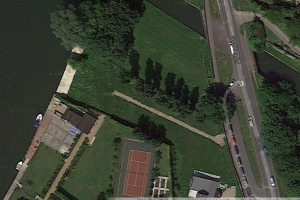 It is in an L-shaped plot with its own river frontage and this is where a serious breach of the river bank occurred, with floods threatening Southlea Road and beyond, due to deliberate removal of the Poplars’ bund or bank. In this photo ‘Poplars’ is in the lower right corner with its garden at first parallel to the road and then turning towards the river, past Woolacombe’s tennis courts. There is a deep clump of trees before the steep bank leads down to the river. 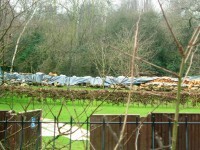 In the summer of 2013, and presumably to improve the view from the Poplars’ garden, the clump of trees was removed and the bank was flattened and re-grassed. This allowed the river to flood up to the property’s wall on Southlea Road and was in danger of bursting through. The army, with the help of many volunteers, built a sandbag wall at the water’s edge to contain the river, but this will now need to be properly constructed as a permanent bund. 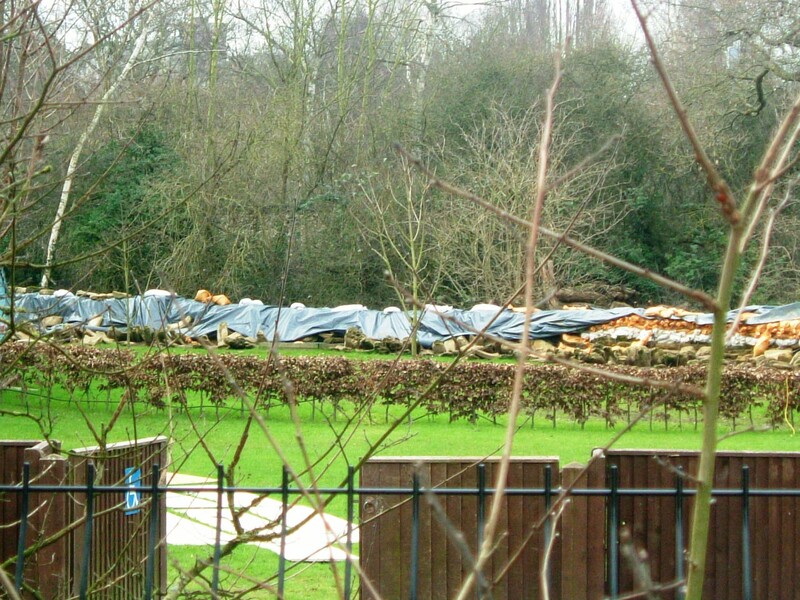 Boundary wall of Woolacombe and The Poplars in Southlea Road being heavily sandbagged to prevent flood water bursting through, while a new sandbag bund was being built at the bank of the river. 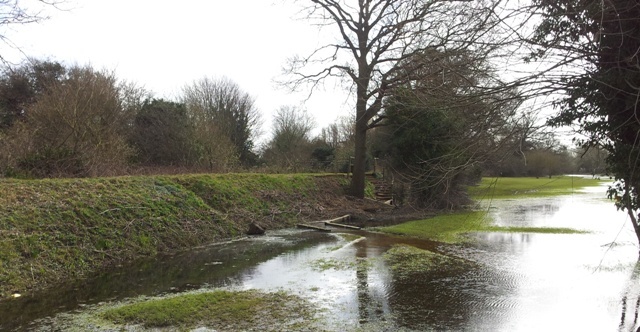 Photographs taken of the Sumptermead floodbank in late February 2014, as the flood receded on the golf course. Three years later, Datchet is much better protected against flooding, but there are still issues to be resolved. Sumptermead Bank/Bund on the Golf Course has been rebuilt by the EA to the standard required close to Eton End School where it had been breached. The access tunnel under the railway at that point has been closed. At Southlea Road the riverside bund at The Poplars has not been reinstated, and no agreement to do so has been reached between the owner, the Environment Agency and the RBWM. The Poplars’ boundarywall on Southlea Road, which was protected by sandbags in 2014, is now bulging outwards and is unlikely to contain flood water in future. In case of flood, the EA currently proposes that moveable/demountable flood barriers will be brought in to protect along both sides of Southlea Road.